Alright, Janes! The new Star Wars movie is here, and it’s been out long enough that, if you haven’t seen it yet, you need to. Here are Four Badass Women whom I think should convince all women to take the plunge and go see this awesome addition to the Star Wars saga. 1. Rey, the main female protagonist, is a total badass. 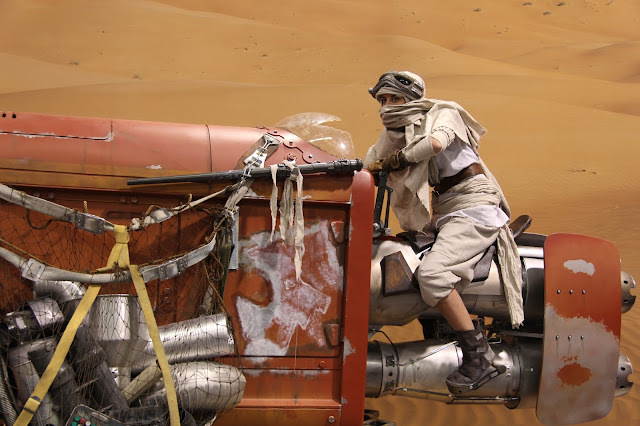 Not only is she fearless enough to climb and scamper in and around old junker ships in the desert of Jakku, but she knows how to fight and defend herself - always an important factor on the badass scale for female protagonists, yes? AND she can pilot a ship she’s never flown before. I seriously have a girl crush. Furthermore, her loyalty and compassion are central to who she is, and provide the main reasons for why her life takes the course it does. 2. Princess Leia - I mean General Leia. So, if any of you have seen the original trilogy, you may remember that princess Leia has always been a badass. Anyone who can lead a rebellion, keep calm under all sorts of pressure, and strangle Jabba the Hut while in a plastic gold bikini has my vote as a leader. In The Force Awakens, Leia is no longer a princess, but a general leading the Resistance. This older Leia is the epitome of grace etched in grief. I can’t say too much without giving spoilers, so I will tell you that I sincerely admire this older Leia, and that the years that have passed and her sensitivity to the Force have given her such an empathy and understanding of people, that she still would get my vote as a leader. 3. Maz Kanata. We don’t know much about this character, but she runs a tavern with scrupulous and unscrupulous patrons alike. She seems to have an affection for Han Solo, which is a major plus in my book, because - Han Solo. She is wise beyond what the audience would expect (always awesome to see in a female one knows little to nothing about), and is the keeper of many wonderful, exciting secrets - which we know only because one gets revealed, which leads the audience to believe that she must keep more. Watch and decide for yourself on that one. Or just trust me. Or both. 4. Captain Phasma. We don’t know or learn much about the silver-armored leader of the Stormtroopers - but she’s a woman leader of the Stormtroopers. This is a huge deal, considering in the past films, very few females were placed in positions of power at all, and there were virtually none (that I can recall, anyway) in the Imperial Army. She is clearly a no-nonsense woman who is clearly capable and respected (or possibly just feared enough to the point that she has the obedience of those under her command). I look forward to learning more about her in future films or books. There you are, Janes! Four Badass Women who warrant your attention if and when you go see The Force Awakens - which I highly encourage you to do! Share your thoughts in the comments section below!